(The Radical decade), which takes a fresh look at the work of this major 20th century artist, tracing the various stages of his career before the First world war, when he was involved in the most radical avant-garde movements. Some remarkable groups of work have been brought together for the exhibition: his 1905 summer pieces painted in Collioure; a series of London scenes, and his very large dance and bather compositions. since the 1994 retrospective at the Musée d’Art Moderne de la Ville de Paris – in other words, for over twenty years. of Picasso to the metaphysical painting of De Chirico and the New Objectivity of Germany. Derain’s daring, highly inventive pre-war work is fascinating. 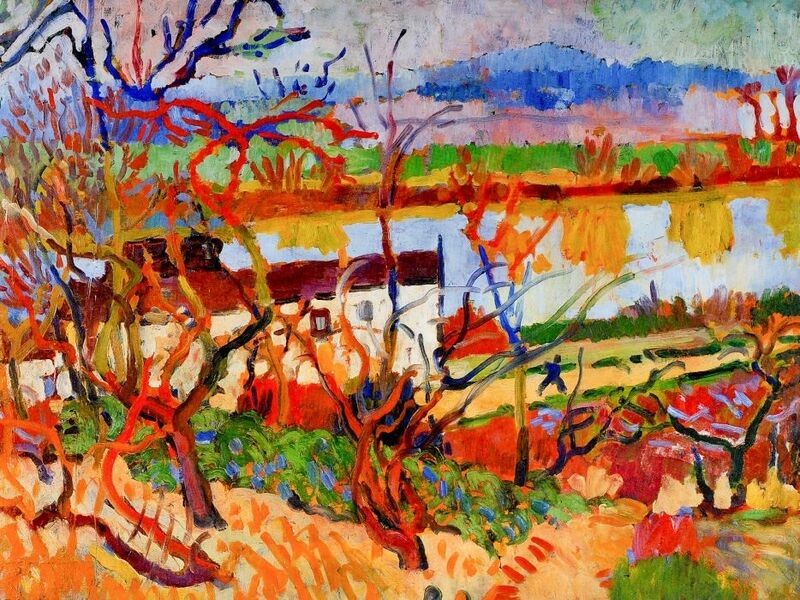 Derain, who was close to Maurice de Vlaminck and Henri Matisse, and then Georges Braque and Pablo Picasso, engaged forcefully with Fauvism and Cubism, developing a powerful body of work up to the First World War. He experimented visually in many ways, tackling painting, drawing, xylography, sculpture, ceramics and film, and practised photography throughout his life, along side his painting. the Maori objects he copied at the British Museum in 1906, and the African sculptures in his collection. and African sculptures and ceramics. - Firstly, derain’s early works, marked by his roots in a realistic, libertarian style with cruel, acerbic drawing, are presented as a foil to his photographs, which date from his early career to the 1940s. His entire work as a painter was deeply imbued by his liking for photographic compositions, no matter how radical, and a certain realism. - his landscapes of Chatou, dating from 1903 to 1904, with their lively colours and innovative compositions, show a simultaneous adherence to and emancipation from the Impressionist model. 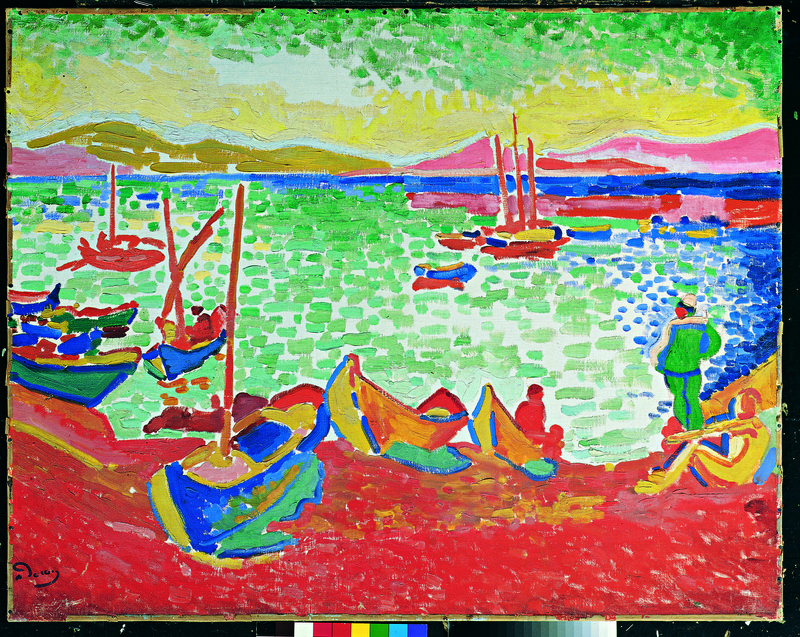 - His pictorial experiments during the summer of 1905 in Collioure, alongside Henri Matisse, were his baptism by fire in Fauvism. - His Arcadian, decorative vein, typified in the large piece La Danse (an exceptional loan) and its various versions in watercolour, were a response to Paul Gauguin’s Tahitian works and the contemporary paintings of Matisse. - The vibrant, synthetic landscapes painted at L’Estaque in 1906 and the flamboyant London series (1906 - 1907) represent the peak of his achievements in colour. - The maori and African objets d’art of the British Museum, which Derain discovered in London in 1906, and the pantheon he built up through his visits to the Louvre, the Musée du Trocadéro and the National Gallery all nourished the neo-archaism of his sculptures and woodcuts. - A period influenced by Cézanne, which started in 1907, led Derain towards a formal and geometric synthesis with a series of large compositions of female bathers (also exceptional loans). 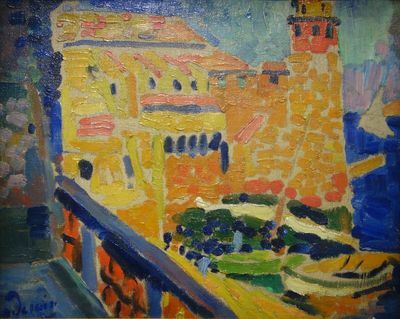 - He then began to develop a personal form of Cubism through his compartmentalised landscapes of Cassis, Martigues and Carrières-sur-Seine with their saturated colours, painted between 1907 and 1909. These were followed by those of Cagnes and Cadaquès, characterised by a crystalline, geometric volumetry. and 1913, producing numerous archaistic portraits, manifesto self-portraits in painter’s clothing, sophisticated, symbolic still lifes and stylised views of windows harking back to Paolo Uccello. (The Golden Age) (1938 - 1944). his war-time correspondence with his wife Alice Derain, edited by Javotte Taillade, the painter’s great-niece. Extracted from the album of the exhibition. 1900. 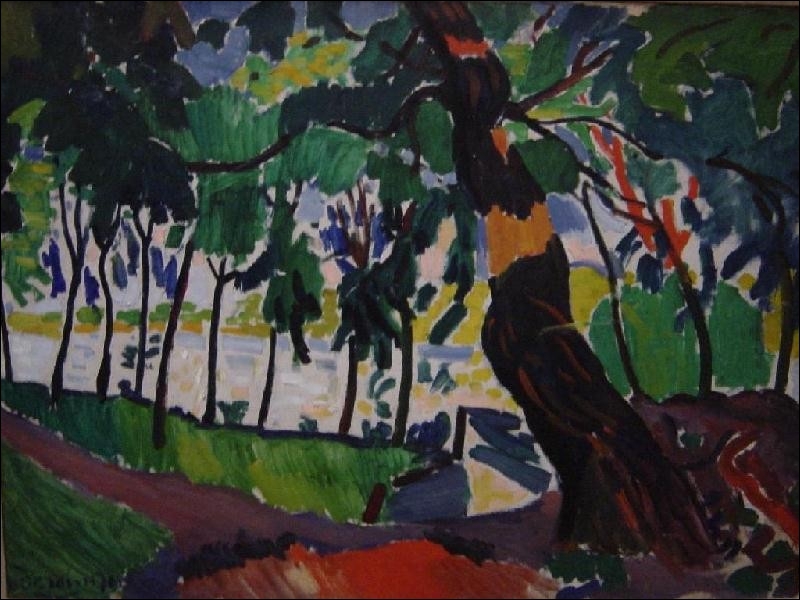 Derain (1880-1954) meets Maurice de Vlaminck, who, like himself, lives in Chatou. The two friends rent a studio in the former Levanneur restaurant adjoining the Maison Fournaise, frequented by Impressionist painters. Derain takes classes at the Académie Camillo in Paris, where he meets Henri Matisse. 1901. Derain copies the Portement de croix (Copie d’après Biagio d’Antonio) [Christ Bearing the Cross (Copy after Biagio d’Antonio)] at the Louvre, then attributed to Ghirlandaio, using pure colours. He visits the Van Gogh exhibition with Vlaminck at the Galerie Bernheim-Jeune. for novels written by Vlaminck (D’un lit dans l’autre [From One Bed to the Other], 1902 ; Tout pour ça [All For That], 1903). 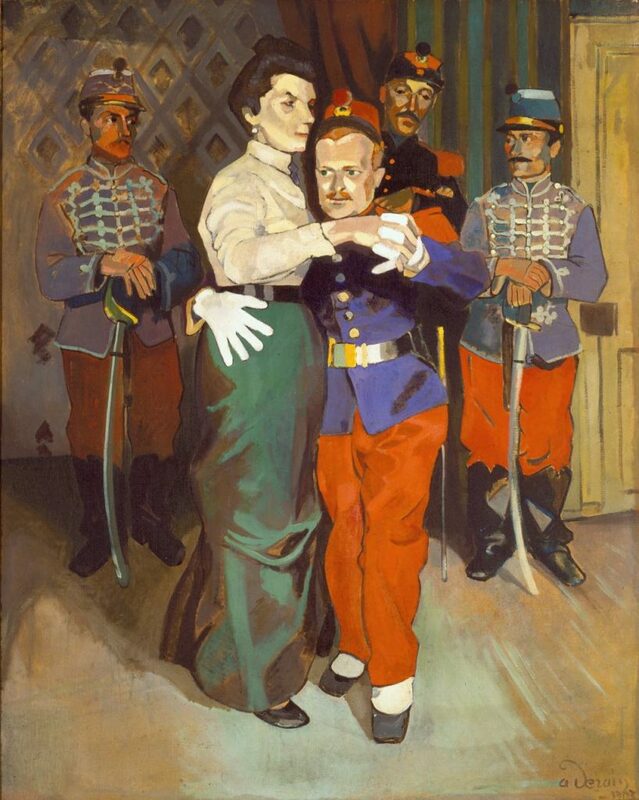 He paints Le Bal à Suresnes [At the Suresnes Ball] (1903) inspired by his life as an army conscript. In late 1904, back in Chatou, he meets Apollinaire. 1905. Derain exhibits at the Salon des indépendants. 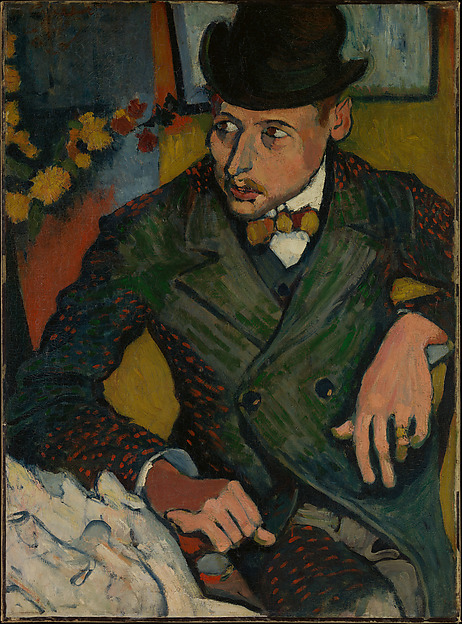 Thanks to Matisse, Vollard becomes his dealer. In July, he joins Matisse in Collioure where he discovers a new conception of light. He exhibits his painted canvases over the summer with Matisse at the Salon d’automne in Room VII, the “cage aux fauves” [“cage of wild beasts”, the Fauvists’ room]. 1906. Derain creates ceramics with André Metthey and experiments with printmaking and sculpture. Visits to London, where he discovers the British Museum and produces a series of views for Vollard. He spends the summer in L’Estaque, near Marseille in the south of France. 1907. The artist meets Daniel-Henry Kahnweiler, who becomes his dealer. He paints in Cassis, where he sees Braque and Othon Friesz. Derain distances himself from Fauvism, becoming more concerned with the architecture of volumes and balanced composition. He moves to Montmartre and frequents Picasso. He meets Alice Géry, who becomes his partner. 1908. 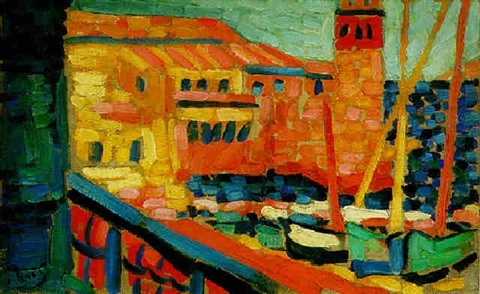 Derain has a long stay in Martigues, before joining Picasso in La Rue-des-Bois. He shows his work at the Golden Fleece exhibition in Moscow, the Cercle d’art moderne du Havre, and the Salon des Indépendants in Paris. 1909. He leaves the south and moves to the Somme (Montreuil-sur-Mer, Neuville, Étaples). He produces etchings for Apollinaire’s L’Enchanteur pourrissant [The Putrescent Enchanter] published by Kahnweiler. 1910. He exhibits at the Mánes Union of Fine Arts in Prague. Visit to Cagnes and travels in Spain : with Picasso and Fernande Olivier, Derain visits Figueras and Cadaqués. In autumn, Alice Géry and Derain move into 13 Rue Bonaparte in Paris. 1911. Discovers Camiers in Pas-de-Calais. Derain’s painting becomes more archaic, in a similar vein to the simplicity of the Italian primitives. 1912. 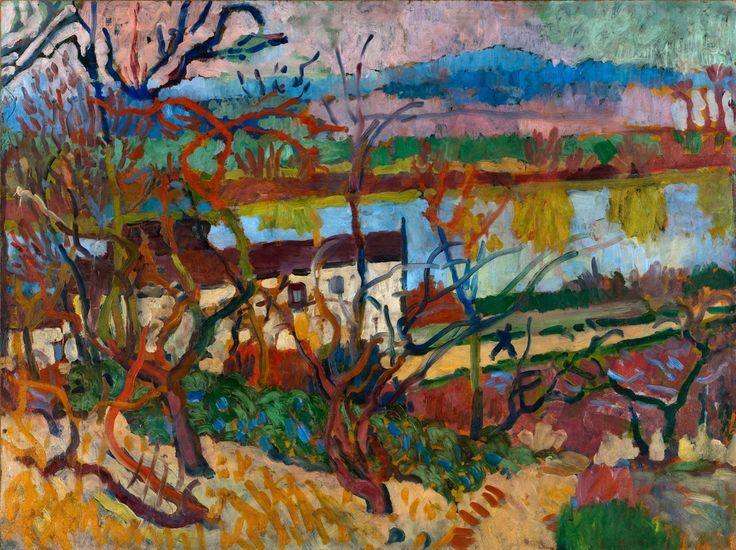 Derain moves to Vers, near Cahors, where he paints around thirty still lifes and landscapes. He creates prints for Les Œuvres burlesques et mystiques de Frère Matorel, mort au couvent [The Burlesque and Mystical Works of Brother Matorel] by Max Jacob, published by Kahnweiler. 1913. 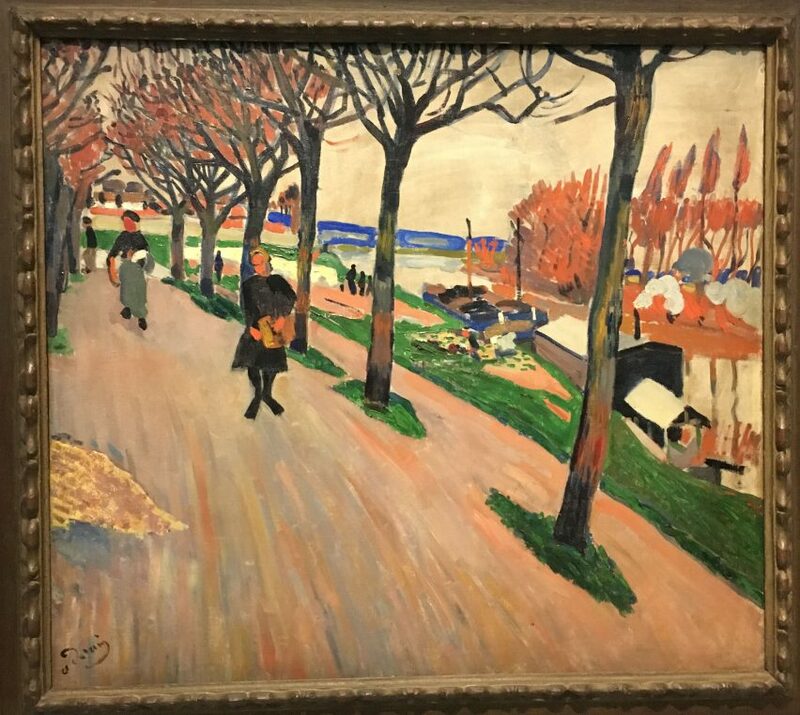 Derain distances himself from Parisian milieues. He mainly exhibits abroad (Valet de carreau in Moscow, Armory Show in New York) and moves to Martigues and Sausset-les-Pins. 1914. Picasso, Braque and Derain are together in Montfavet near Avignon when war is declared. 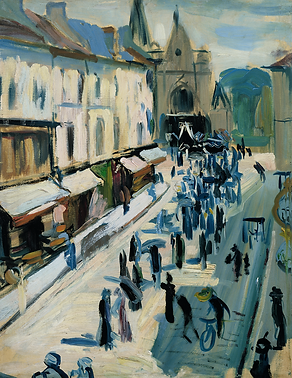 Derain is mobilised : he is posted in Lisieux. 1915. Derain paints Paul Poiret’s portrait, who was also billeted to Lisieux. in the second Battle of Champagne. In Paris, several of his works are featured in the collective exhibition held at the gallery-boutique of Germaine Bongard, Poiret’s sister. 1916. Derain fights in Douaumont. At Apollinaire’s initiative, his first solo exhibition is held from 15 to 21 October at the Galerie Paul Guillaume, Avenue de Villiers, in Paris. 1917. Derain participates in the fighting at the Chemin des Dames. a former associate of the Soirées de Paris, Apollinaire’s magazine, organised a solo exhibition for Derain, from 3 to 24 November. André Breton writes a poem, “André Derain”, which he reads at the first poetry reading and musical session at the new Paul Guillaume gallery, on 108 Rue du Faubourg-Saint-Honoré. 1918. 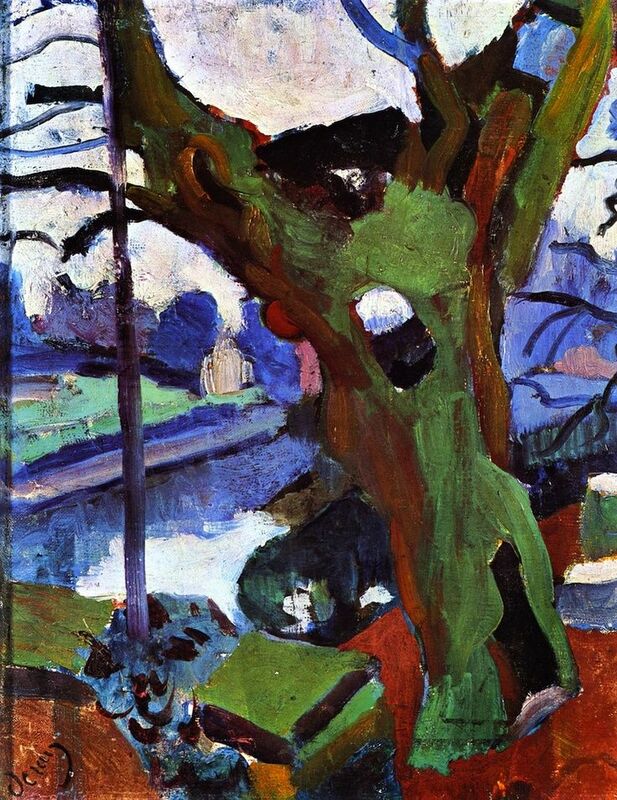 Walther Halvorsen supports Derain financially, paying him a monthly allowance as an advance on future paintings. Death of Apollinaire on 9 November. of his obligations on 10 March and returns to Paris. He designs sets and costumes for L’Annonce faite à Marie [The Announcement Made to Mary] (1918-1919) by Paul Claudel, for Arsène Durec’s troupe on tour in the Scandinavian countries. In May, he leaves for London to create the sets for the ballet La Boutique fantasque [The Magic Toyshop] (choreography by Léonide Massine, music by Gioacchino Rossini) for Les Ballets Russes. He publishes prints in Mont de piété [Mount of Piety] by André Breton and Ballade du pauvre macchabée mal enterré [Ballad of the Poor Badly Buried Stiff] by René Dalize, who was killed at the front. (La Cassette de plomb [The Lead Casket] by Georges Gabory, 60 woodcuts for Calumet [Peace Pipe], by André Salmon). 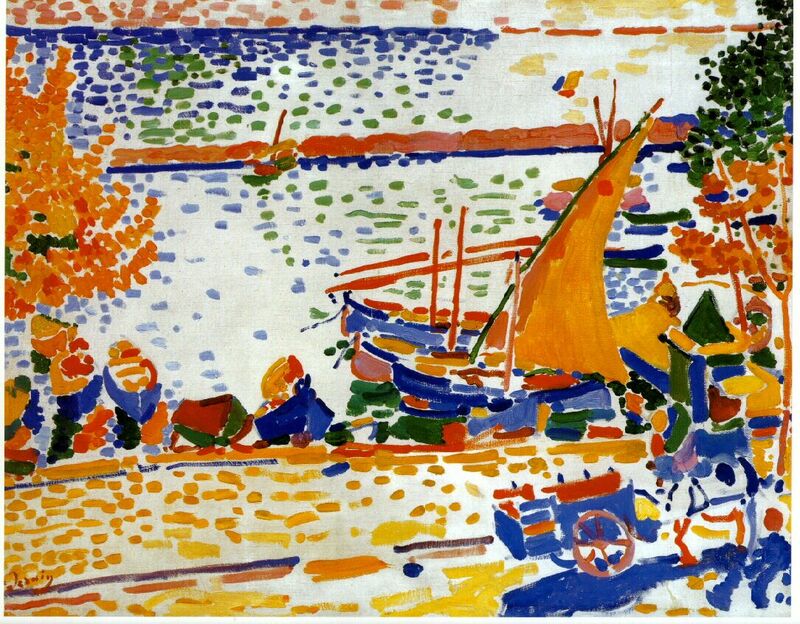 Derain dies on 8 September 1954. Musée d’art moderne de la Ville de Paris.